Like I said, we were smack dab in the middle of debt payoff and a new microwave wasn’t a big concern of our. On top of that, all of our current appliances were white. We knew that when the time came we would want to upgrade to stainless steel. So were we supposed to upgrade everything right now? That would easily set us back a few thousands dollars that we were really wanting to put toward our debt payoff. We knew that that was not a financially wise choice. Considering the fact that we had already spent the last few decades of our lives making terrible financial decisions, we were doing anything we could to break those old habits. Our top priority was debt payoff. Plus, warming leftovers, coffee or cocoa in a pot was really not that difficult. 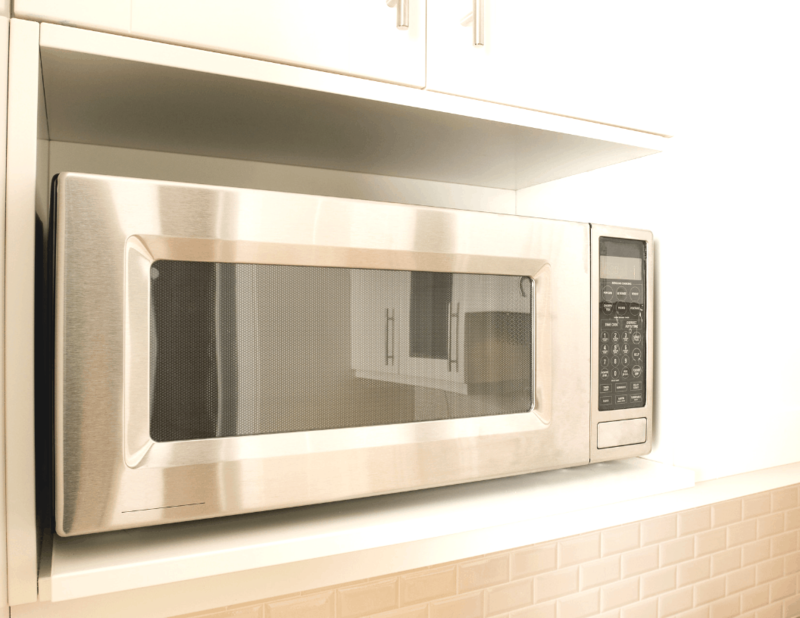 After deciding we should probably put a microwave back in our house we decided we would just upgrade the microwave to a stainless steel one even though it would mismatch all the other appliances. Sure this goes against everything Tom’s OCD tells him to be, but hey, we live on the edge. Part of the main reason I didn’t care at all about mismatching appliances and in fact…kind of welcomed this quirky change was because of something I heard from a fellow traveler while we were on vacation in the Dominican Republic. As we shared a van to make our way toward the airport, this guy was telling us about their recent trip to (I believe) Jamaica. While they were driving around he noticed a lot of cement slabs in the ground. After a while he asked his driver why there were so many. The driver explained that people there built their houses that way. When they could afford to add, they added. Until then, they lived with what they had. What a wild concept considering how most Americans are living their lives these days! Who needs to have money for something when you can just charge it? Well, I hate to break it to you America, but I want off that merry-go-round. Sure, it’s not a cement slab but I’d like to think this mis-matched microwave is a constant reminder to only own what I can afford. Even if it mean my home is less than magazine worthy. Thanks Marissa. It absolutely makes us appreciate it more. Working and waiting for stuff makes the reward so much sweeter. AMEN! Look kids, we aren’t the only ones. We aren’t crazy we are smart! My grandmother used to say don’t be penny wise and pound foolish. Being in debt is pound foolish paying off interest and NOT earning interest either financially or investing in memories. We don’t always have to buy more stuff having financial resources to help others, have life experiences like travel or go to a play, or invest in an opportunity that pops up. Those are a few of the reasons I’m not going to be tied down to debt/aka “keeping up with the neighbors”!! I love this. Your grandma sounds like a wise woman.